The "Bearing capacity" frame displays the results from the analysis of foundation soil bearing capacity. The stress in the footing bottom (assumed constant) is derived from all verifications performed in the frame "Verification". The programs "Spread footing" and "Spread footing CPT" then considers all verifications as load cases. A restriction according to Fig. 4-4, page 73 of NCMA manual is neither automatically enforced nor checked by the program. The bearing pad must be introduced into the program so it complies with the design criteria. The input field allows to specify the foundation soil bearing capacity. The results of verification analysis of a soil for eccentricity and bearing capacity are displayed in the right part of the frame. 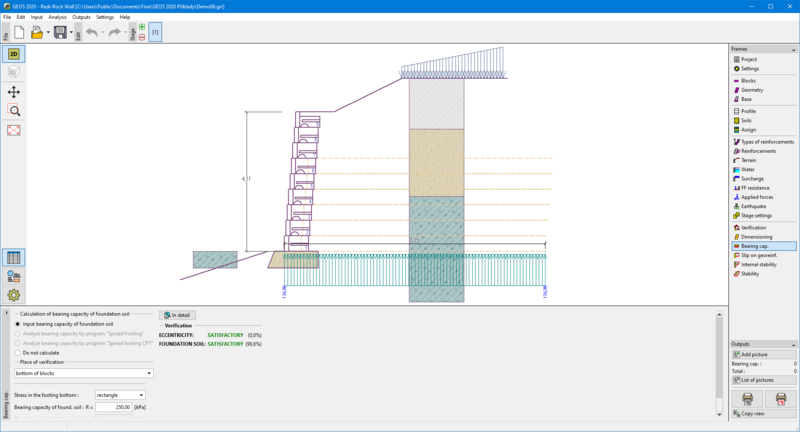 The "In detail" button opens the dialog window that displays detailed listing of the results of verification analysis of foundation soil bearing capacity. Compute the foundation soil bearing capacity using the program "Spread footing"
Pressing the "Run Spread footing" button starts the program "Spread footing" that allows for computing the soil bearing capacity or settlement and rotation of a footing. Pressing the "OK" button leaves the analysis regime - the results and all plots are copied to the program "Redi Rock wall". The program "Spread footing" must be installed for the button to be active. Overall length of wall foundation is input. Analyse bearing capacity by program "Spread footing CPT"
The procedure is identical as if calculating soil bearing capacity by the "Spread footing" program. The foundation soil bearing capacity is not computed. The program allows to specify a shape of stress in the footing bottom.